On Feb. 21, 2018 Five Red Rose Rescuers- namely myself Monica Miller, William Goodman, Patrice Woodworth, Matthew Connolly, and Robert "Doc" Kovaly were found guilty of trespassing and also interference with an officer (we practiced passive resistance) by a 6 person jury stemming from our Dec. 2, 2017 pro-life rescue at the Women's Center abortion center in West Bloomfield, MI. operated by abortionist Jacob Kalo. On March 14, 2018 Judge Barron sentenced each rescuer to a $500 fine, 8 days of community service, and a one-year probation loaded up with unbelievable conditions such as remaining 500 feet from all abortion centers in the entire United States of America and its Territories—a court order unprecedented in the history of legalized abortion! We were forbidden from picketing at any abortion center, no intimidation or harassment of patients ( court language for no attempt to talk women out of abortions) defendants could have absolutely no contact with one another, were to report to a probation officer monthly, needed court permission to leave the state and so on! On June 1st Will Goodman and I decided it was time to go back to the Women’s Center and simply exercise our rights, civil and certainly God-given, to witness to the sanctity of life and reach out to the mothers going into the clinic and turn them away from abortion. 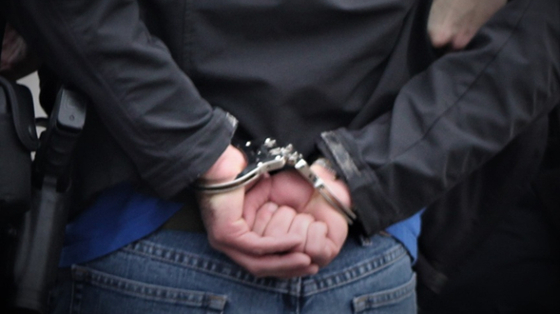 Consequently we were both arrested, accused of violating the conditions of the probation. BUT, while I stood 30 feet from the door of the Women’s Center that day I talked a woman out of an abortion! Thank God we defied that 500’ foot probation condition! I was indeed at the right place at the right time despite Judge Barron’s 500 foot restriction. On June 14th Judge Barron revoked the probation and sentenced Will Goodman and I to a 45-day jail term. William had been in jail since our arrest June 1st. I was taken into custody June 14th and released July 17th. On June 29th all 5 Red Rose Rescuers, with our great attorneys Robert Muise and Erin Mercino of the American Freedom Law Center, were back in court for the restitution hearing. 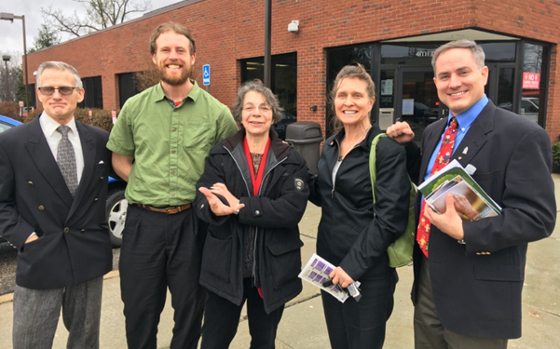 Yes—the Women’s Center was asking the court to impose monetary restitution on us for revenue lost due to our rescue! 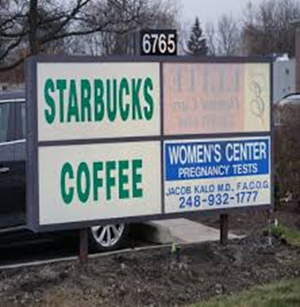 Photo: Yes, Starbucks is in the same building as the abortion center! Clinic manager Pam DiMaggio took the stand and under oath—complete with a chart for illustration—testified, to the shock (and delight) of the pro-lifers who filled the courtroom, that 12 women DID NOT receive their abortions due to the “disruption” caused by the “trespass” (aka-The Red Rose Rescue). No one could believe that a dedicated “abortion provider” would publicly announce that the pro-life rescue had been so incredibly effective! DiMaggo also stated that every woman was called and not a single one responded to the calls! And despite her best effort Judge Barron ruled against the clinic! No restitution for them! It was an incredible victory! Thank YOU GOD! But please know, if Barron had ordered us to pay—we would NEVER have given this death center one cent—no matter what the consequences! 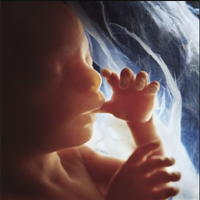 DiMaggio’s testimony means this: because of the Red Rose Rescue 12 unborn babies were at least given a reprieve of their scheduled executions! 12 women had a chance to reconsider their abortion decision! Indeed, DiMaggio’s chart indicated that “Patient number Two” left the clinic during the rescue. This turn-away we already knew about—as we witnessed the woman leave the clinic after she was counseled by Red Rose Rescuer Patrice Woodward! Then there were 11 others whose babies were still alive! We know that as a consequence of the RRR, at least one baby was saved (on June 1st when we defied the probation conditions) and likely there were more saved. The law of averages is on our side—that at least one of the 12 women opted to give life! I could write a book about the saga of this one Red Rose Rescue. My 33 days in jail, the many great experiences I had while incarcerated would be certainly part of the story. Let me say this—my fellow inmates were very sympathetic as to why I was in prison—many appalled that I was in jail at all! I continue to pray for them! A few of the inmates talked to me about their abortions and how much they regretted them! One woman told me the incredible story of how two years ago she was convinced by a sidewalk counselor not to go through with her scheduled abortion at a clinic in Detroit—and I knew EXACTLY who that sidewalk counselor was who saved her baby from the description she gave of him—namely Emmanuel Ibirham. I want to thank all those who wrote to me during my jail time, all of you who prayed for us—and for your support of the Red Rose Rescue. Don’t neglect to write to Matthew! !